This project was first proposed to me by a pilot who wants to create a man-carrying scale replica of the P-51D, for use in the "recreational", or possibly "experimental" category. My job was to create the exterior only, for use in creating parts using the "lost foam" method, but the parts could also be used to create male plugs, from which female molds could be created. The customer will provide his own structural parts, which will probably consist of a metal tubing structure, to which the exterior parts are attached. Having done this sort of work for various aircraft in the past, and being a fan of the P-51D, I was excited to do this work. As it stands now, the actual aircraft will be a little over 21 feet long. (It may be rescaled later, if required.) For now, I'm keeping the name of the customer private, but as he gets into the fabrication and assembly stages, I'll probably post his name, and perhaps a link to his project web site, if he creates one. It's important to know that this project was begun before many decisions about the propulsion and interior structure had been defined. With that being the case, I had to remain flexible during the process, as the usual problems surfaced, and also as the methods for creating the final (actual) parts changed during the build. In some cases, multiple versions of some parts were created, to offer various fabrication options, and that's what you will probably find most interesting about the MODO process. Catmull-Clark subdivision surfaces ("Psubs", in MODO) with edge-weighting and all-quad polygons were chosen as the method to use, because ultimately, the "Power subD - NURBS" plug-in would be used to export NURBS parts for machining. This method also provides the most versatile and "future-proof" geometry, which is important in a project like this. The most important modeling consideration is that these parts will be created via machining, and/or possibly molded. So, unlike a model intended for rendering alone, all parts must be "possible" in real life. (no parts penetrating each other, etc.) Draft angles become important for assembly and/or molding. Because of the construction methods used on the actual aircraft, the exterior surface is composed of many relatively-small sheet metal panels, riveted to internal formers. That means, from a modeling point of view, ALL of the surface is composed of panel seams and rivets. While this could've been modeled. it would've taken much more research and documentation, much more modeling time, and ultimately would've cost much more. Remember that unlike a model intended for rendering alone, textures won't work for this purpose, on a model intended for fabrication. As you'll see later in this article, various "cut" lines were considered, for various assembly methods. This meant that any seams modeled into the parts might not work properly, if cuts were made across those seams and rivets. Ultimately, I suggested that since the panel lines and rivets were not structural, as they were on the actual P-51D, those things could simply be painted on, after fabrication, saving time, money, and labor. As usual, we start with the documentation..
Don't attempt to model anything airworthy from the drawings shown in this article! Features from several different drawing sets were required to create this model, as well as extrapolated features from photographs alone, and not all of those things are shown accurately here, to discourage copying. After choosing a set of drawings that we believe to be accurate, those were sliced up and scaled in Photoshop, so that they could be used as backdrop items in MODO. It's important to check at this stage, to be sure all the drawings match each other, and in this case, they did. Note that the primary drawings were actually created by Chad Veich, for a quarter-scale RC aircraft, and not a man-carrying version. These were licensed by my customer, and were used to create the major exterior shapes, (and none of the interior shapes) which were refined later. 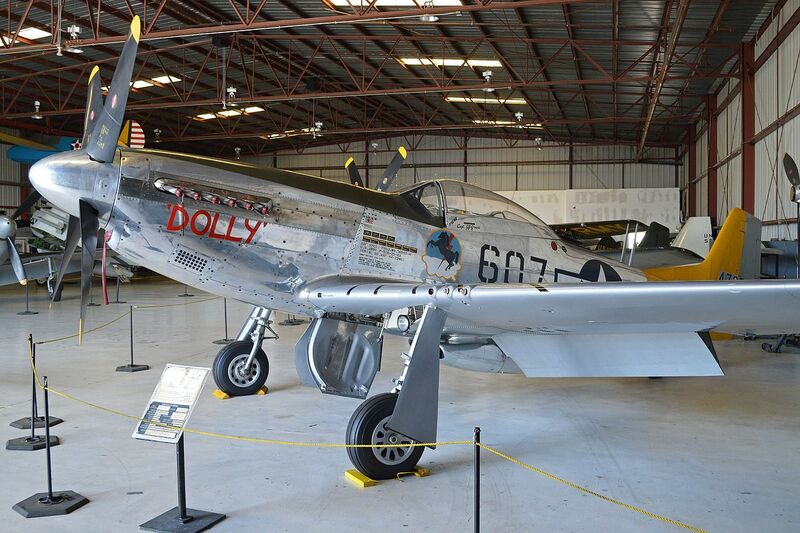 The most important items, such as airfoil profiles, were referenced as a starting point for the flying surfaces, and adjusted slightly for the man-carrying version's relatively-low predicted airspeed, after researching the various airfoils used on the actual P-51. Before doing any modeling, all of these were checked several times to be sure they were scaled to the correct size. Doing this step ensures allows for the MODO parts to be created at 1:1, with no scaling conversions required later. This drawing preparation stage is one of the most tedious. 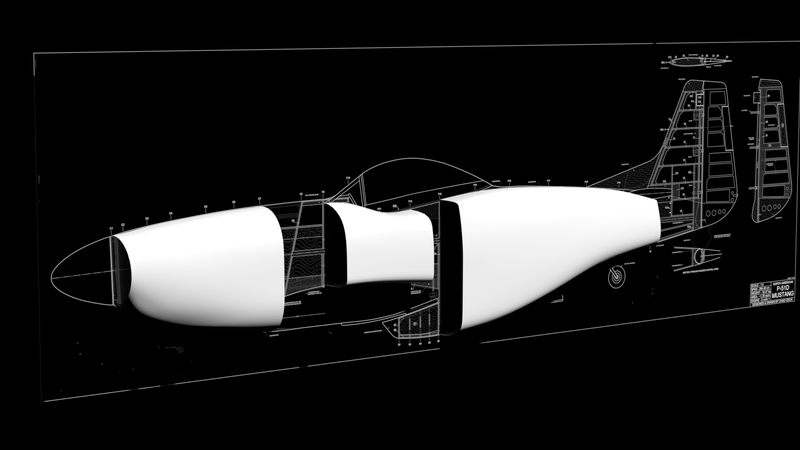 For a project like this, 12 "master" drawings had to be sliced up into individual parts (fuselage formers, wing and tail ribs, canopy cross-sections, etc.) and then scaled within MODO, so that everything matched. This can take days to weeks, depending on the tools you use, and your familiarity with them. In my case, I used Photoshop to make the "cutouts", and MODO (backdrop images) for the scaling. 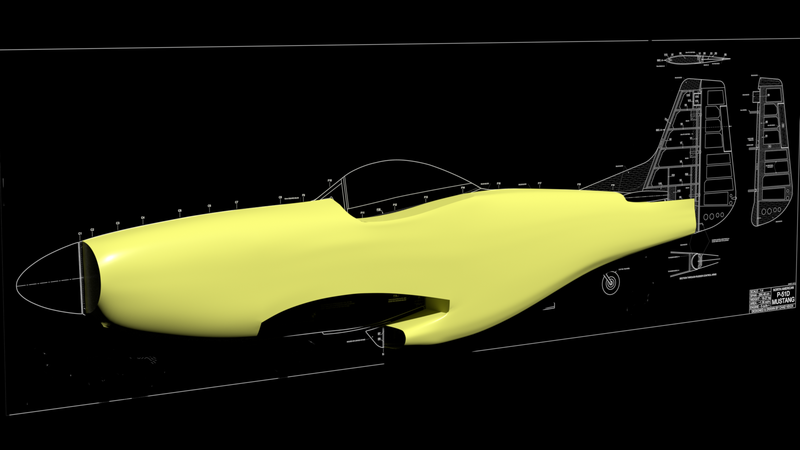 This model was a little tricker, since references came from two different sets of drawings, originally created at different scales. It's a vital step though, since generally, no model can be better than it's documentation. Due to the nature of the RC-style formers, major forward, mid, and aft skin segments were created first. Then, the separate skin segments were joined, so I could begin smoothing the surface, refining the geometry, and adding the required edge-weighting. At this stage, I started referencing many photos of the actual aircraft, to carefully smooth certain areas, while leaving other areas relatively "flat". Part of the ongoing process, after joining skin segments, was to try and keep the polygon flow moving in sensible (mostly horizontal and vertical) directions, and to keep the polygons close to the same size, when possible. The green item, located at the X-axis center of the model, is a "ruler" I created, to show my customer that the scale was correct. So... The original plan was to create a fuselage shape like the one shown above, so that a one-piece wing could be attached, and that the vertical fin/rudder would be made as one piece (for separation later), and the horizontal stabilizer/elevator would be made as one piece, also for separation later. The forward canopy frame would be added later, as well as the (aft) sliding portion. No plans were initially made for landing gear doors, because it was unknown whether the gear would match the actual aircraft's geometry or not. 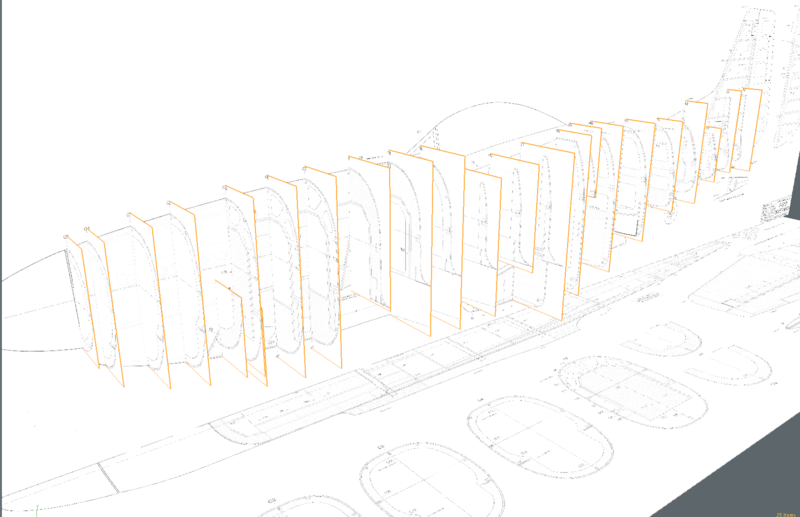 In the following pages, I'll show how these plans evolved, and how that affected the modeling.